Chain-link fencing is the perfect solution for homeowners to establish a strong, secure property line. Residential Chain-Link fencing is low-maintenance, highly durable, weather-resistant, and can last for many years. Plus, it is affordable, both in up-front costs and in the long run, making it a wise investment. Residential Chain-Link fencing is available galvanized and also in black and green for an upgraded look and even more strength. Strength: Because it is made of steel, chain-link is the strongest fence material option available and, therefore, the ideal choice where security is the most important consideration. We can also create a stronger chain-link fence for your property by using thicker fabric (mesh), larger top rail, adding bottom rail, or tension wire, and even installing thicker posts. We make the gates that we install in our custom welding shop. We can therefore accommodate any specific size requests and control the quality of each gate’s manufacturing. This is another Ace distinction that offers our customers Peace of Mind. 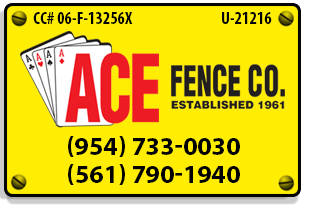 Ace sells chain link, and other, materials for the do it yourselfers and can make custom gates made to order. Ready to learn more? 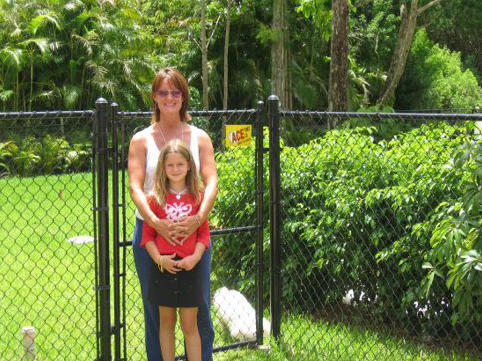 Click here to request a FREE Quote on Chain Link Fences!